Bluetooth connectivity for easy data management! 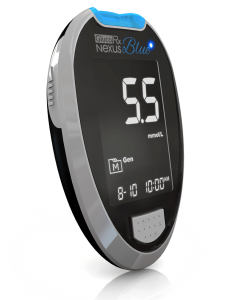 The GlucoRx Nexus Blue meter is a quality and affordable product that facilitates simple management of diabetes with key features such as no coding, 0.5µL blood volume for a reaction in 5 seconds, before/after (AC/PC) presetable, AST, ketone warning, strip ejection facility, large non-deletable memory, day averages function, alarm reminders and discreet testing for those seeking stress-free, fast, precise and reliable measurements. Data can be transmitted from Nexus Blue to a Smart Phone via Bluetooth using the ‘GlucoRx Nexus Blue App’. GlucoRx Nexus Blue meter uses only GlucoRx Nexus Test Strips and GlucoRx Lancets. The GlucoRx Nexus Test Strips utilise advanced GDH-FAD enzyme technology which avoids interference from blood oxygen variations for more accurate blood glucose measurement, and has no reactivity to maltose in dialysis. The GlucoRx Nexus Blue starter kit includes a blood glucose meter with batteries, 10x test strips, control solution, lancing device, 10x sterile lancets, instructions manuals, monitoring diary, warranty card and carry case.